The Gallery Cafe is somewhere I’ve been meaning to write about for awhile. I’ve now paid it two visits, once for breakfast, once for lunch, and both times have been excellent. 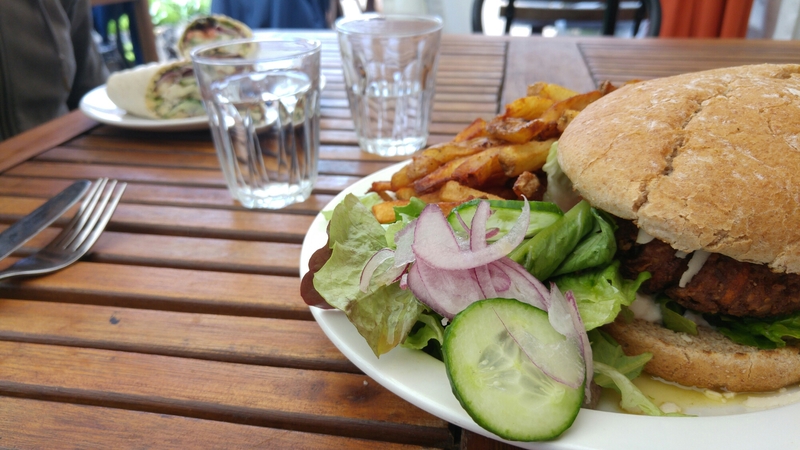 It’s a vegetarian restaurant, with a fantastic vegan selection and its delicious. Usually, when we hear “vegetarian food”, the first thing that springs to mind is limp salads and some kind of falafel concoction. 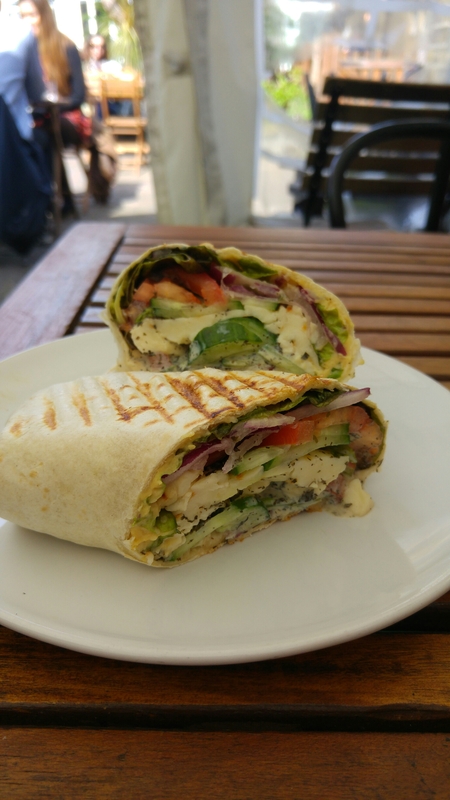 You’ll find falafels and salads here, if that’s your bag, but there’s so much more too. It’s also a not-for-profit that uses locally sourced ingredients and sustainable packaging – what’s not to love? I’ve been a vegetarian for most of my life, and I’m still delighted when I can find restaurants that do regular foods in a vegetarian version. 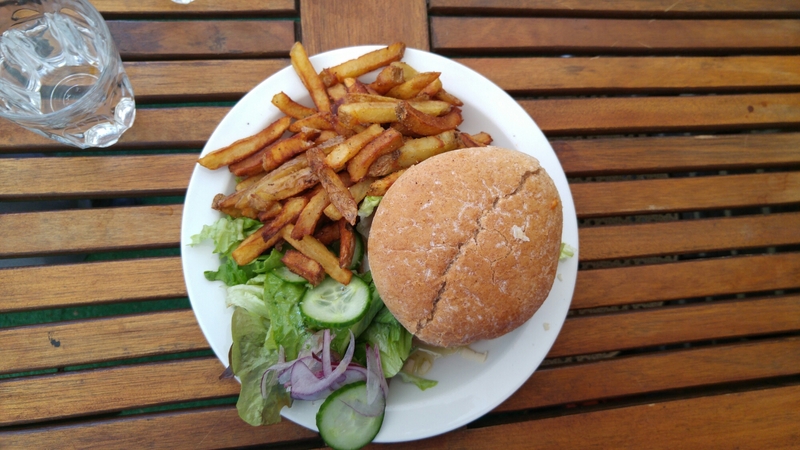 I love a burger and fries as much as the next person, and the vegan burger I got in the Gallery Cafe was delicious. When I went for lunch, the Bulgarian ordered a halloumi wrap and I got the vegan burger. I love when my boyfriend gets food I can actually taste, because he sure steals enough of mine! 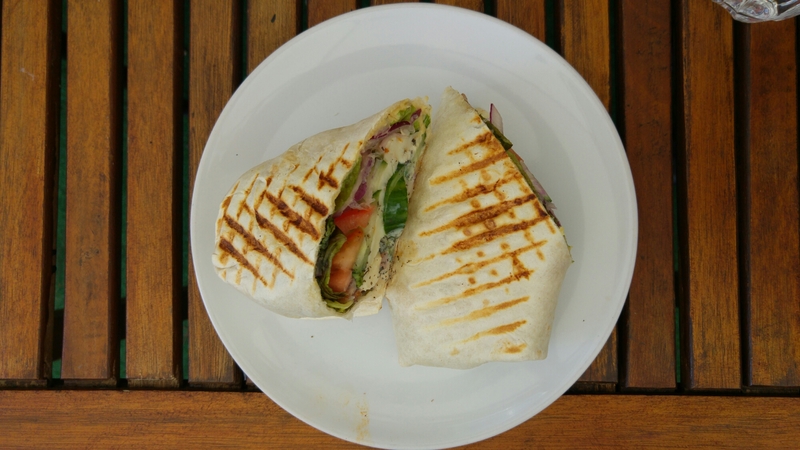 I’m not usually a fan of mint in food, but it’s hardly present in this wrap, and the ingredients just tasted really fresh and tasty. I’ve already told you about the yumminess of my burger, but man, the chips were really something special. True to my national stereotype, I’m a big fan of the potato, and am forever in search of proper, skin-on chips. These guys do chips that are the perfect combination of crispy and potato-y. The other visit the Bulgarian and I paid was for breakfast. 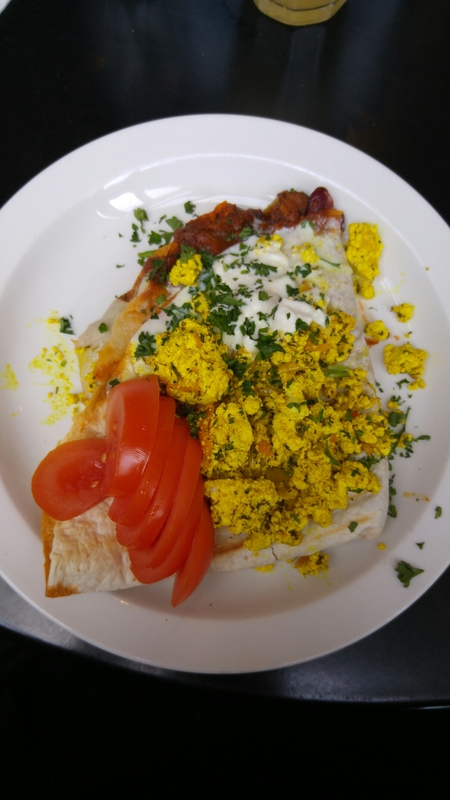 I ordered the quesadilla with tofu scramble, a vegan alternative to scrambled eggs. The quesadilla was made with dairy free cheese, which I’m usually not a massive fan of, but this was good. The tofu scramble was fun to try too. It’s got turmeric added, which gives it its yellow colour. It’s definitely something I’d be willing to try recreate at home. 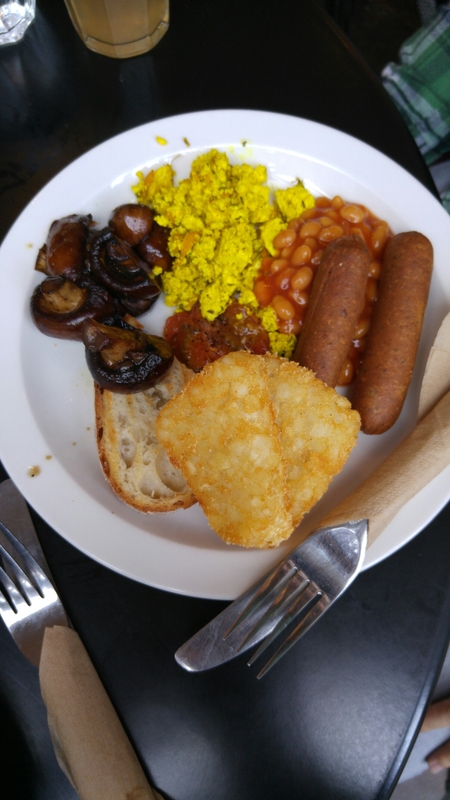 The Bulgarian’s breakfast was the veggie fry up with mushrooms (yuck), sourdough toast, hash browns, veggie sausages, beans and tofu scramble. It was really good, and he seemed to enjoy it, but I think we both preferred my quesadilla. The Gallery Cafe is on Old Ford Road, located right next to York Hall. One of the lovely things about its location is its on the way to Victoria Park, so on both visits, the Bulgarian and I ventured to the park for a walk after our meals. Given that there’s many a Saturday morning spent with a sore head, there’s something quite pleasingly virtuous about waking up early enough to go get breakfast or brunch and go for a nice long walk around a pretty park. Next time you’re in the neighbourhood, why not check it out?